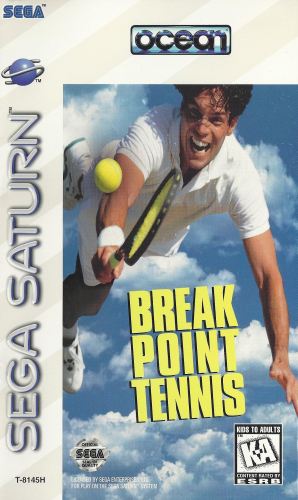 Hard to hit serves, blistering backhands, forehand smashes, and touch volleys come to the Saturn with BREAK POINT TENNIS. Take control of one of eight different players, and become an international champion. You will have to play in eight unique stadiums on four different surfaces (grass, clay, indoor, and asphalt). While competing in a match, you’ll notice that the players look and move realistically thanks to 3D graphics and motion capture animation. When a call is close, you can view an instant replay to see if the umpire got the call right. When your friends come over, you can have up to four players going at it in a doubles match. Experience tennis like never before with BREAK POINT TENNIS.